Embracing Naturally Sourced - Cutting Edge Ingredients-the newer skincare/cosmetic labels from ladies- are gaining favor without the massive marketing budgets or fancy packaging of the big names. Today's consumers have easier access to everything -including information on what works, toxic ingredients to avoid (the well respected EWG's -or Credo Beauty's lists of no-nos-avidly read), awareness of the Canadian Euro Zone's Cosmetic Directive -a ban of 1300+ chemicals-.and the latest science vs the hype. Founded by two women-APPRIYA is a special skincare line based on mineral rich, mountain sourced neutral pH waters containing respected skin/nail strengthener-skin volume inducer, silica- and copper-a natural anti-inflammatory/anti-bacterial-as its main ingredient. With the added benefits of an impressive list of other active ingredients in each product-i.e. the Mineral Complex Serum-with moisture imparting workhorse hyaluronic acid, anti-radical slayer-scientifically respected niacinamide -formatted to target skin tone and texture, and known soothers coconut oil, lotus flower extract and brightener evening primrose seed extract--- all Appriya products are effective powerhouses- delivering hydrating, bio-degradable nano-particles to effectively seep deep into the dermis-combating environmental stresses, and supporting collagen and skin builder elastin fibers for a radiant, more youthful appearance. We were- as we know loads of people who part with serious coinage to drink only the finest mountain sourced alkaline waters...and we personally have experienced the skin healing-anti-inflammatory waters of those glorious Hokkaido-Japan hot springs ...so it would make sense that the same positive healing benefits from special waters... could be incorporated into a skincare line-respected for efficacy. Five APPRIYA products are available now-a Mineral Cleansing Mousse-that comes in a pump bottle-nifty-it's liquid then pleasingly turns to a refreshing foam (one pump dose) that gently removes serious city dirt and long-wearing makeup, a Mineral Tonic - a milky essence/toner hybrid (imo) that one sparingly splashes on/into cleansed skin-containing sea acid-that smooths skin, cell stimulating plant growth factors and a mushroom extract-a natural astringent that minimizes pores, a fast absorbing facial/neck Mineral Complex Serum (aforementioned), a soothing wrinkle smoothing Delicate Zone Serum (we used on our entire eye socket)-with heavy hitting anti-oxidant Nano Q-10, and a Comprehensive Mineral Day/Night Cream-infused with costly Colloidal Gold-an anti-inflammatory/anti-bacterial skin healer, and Vitamins A, E + B3... our daily staple now (LOVE IT)...fyi bonus packaging points here-it is in a ingredient preserving pump bottle that protects the integrity of the ingredients-vs the formula spoiling screw jars of other brands including pricier ones! 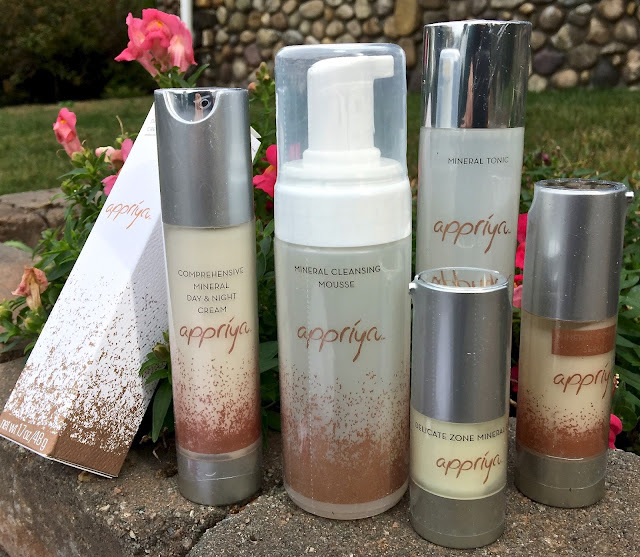 Clearly-Appriya is a high end skincare assortment -with multiple proven effective ingredients high on the contents' list---not cheap fillers---and appropriately packaged. And as anyone from the age of mid 20s up -has anti-aging concerns- we think Aprriya's serums and day/night creams in particular- are perfect- targeting fine lines/wrinkles, packed with stimulative positive ingredients for a more even skin tone-including fading brown spots (serums)...and delivering meaningful prevention-making this line suitable for all skin types. Even super sensitive skin can benefit from Appriya- we barely detected a scent...and even our worked up raw dermis-courtesy of serious workouts-including pool swims...practically drank up Appriya-tonic, serums, day/night cream (in that order). Also-size-wise -products should last 3-4 months when used as recommended. NOTE: sunscreen/makeup went on easily on top of fast sinking Appriya...no need for primer-as our skin was notably smooth and plump (in that good way-not puffy lol)...even after only using the regimen for a week. NICE. We even got compliment when-after only a few day's use of Appriya's regimen -which needed only a about 4-6 minutes, 2x day)... we went to get a facial at a rather posh spa...where/when let's fact it (pun intended)-we expected a list of dermal ailments to be remedied. Progress. ECO NOTES: Sustainably sourced waters are planet and cruelty free-plus Appriya products are formulated WITHOUT sulfates, parabens, diehalonomides, mineral oils, bithionol, methylene chloride, vinyl chloride, zirconium containing complexes or prohibited cattle materials. Factoid-Appriya is Sanskrit for beloved water.